Syria’s State media and pro-Assad websites are claiming an advance by the Syrian army on the historic city of Palmyra, captured by the Islamic State in May. State news agency SANA says Assad forces captured areas west of Palmyra such as Nazl Hayyal, the al-Qadiri farm, and Thaniet al-Rajma, killing 35 Islamic State fighters and injuring at least 90. The operations were supported by airstrikes on and near Palmyra. Al-Masdar News claims the village of al-Bayarat and the hill Tal Al-Maramleh, about 11 km (7 miles) west of Palmyra, were taken. 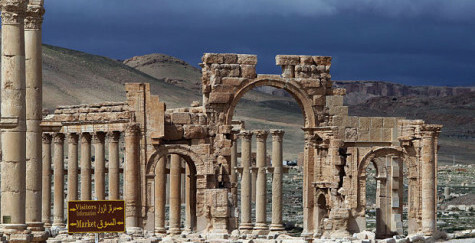 Palmyra, famed in the Roman era as an oasis stop for travelers, was seized by the Islamic State two months ago after a rapid offensive that claimed much of eastern Homs Province, including oil and gas fields, in central Syria. After a series of defeats by rebels and the Islamic State this year, the Syrian military is seeking its first significant victories, both in Palmyra and in an offensive with Hezbollah against rebels in Zabadani, northwest of Damascus. Activists report that at least 15 civilians were killed on Wednesday in a regime barrel-bombing in Aleppo city. They said that four children, all under 10, and a pregnant woman were among the casualties in the Karam al-Beik district. The bomb hit as residents were at an iftar meal breaking the Ramadan fast. The website of the Syrian Observatory for Human Rights, the British-based outlet which claims to bring out news from the ground in Syria, has been hacked and is off-line. The cyber-attack was purportedly by Islamic State supporters, calling themselves “The Cyber Army of the Khilafah”. They posted an image of Observatory director Rami Abdulrahman, superimposed on a hostage wearing an orange jumpsuit and kneeling next to an Islamic State militant holding a knife. The image is gone, but attempts to reach the site return a 404 Error message. The SOHR presents its claims as reports from a network of well-placed sources inside Syria, but the news — which usually resembles chatter circulating on social media — is rarely verified. Despite this, many mainstream media outlets rely on the “monitoring group” for their coverage of the Syrian conflict. The US-led coalition said that it carried out seven airstrikes on Islamic State targets in Syria on Wednesday. The Combined Joint Task Force said a strike near the Islamic State center of Raqqa hit 20 “staging areas”. There were also two attacks near Aleppo, two near the Kurdish center of Kobane, one near Al Bukamal on the Iraqi border, and one near Tel Abyad on the Turkish border. There were also 14 attacks on Islamic State positions in Iraq yesterday. Zahran Alloush, the leader of the prominent rebel faction Jaish al-Islam, is putting out a series of messages hailing the success of the fight against the Assad regime. A video has been posted of Alloush’s speech, with English translation, putting out the message in late June on his return to Jaish al-Islam’s base of East Ghouta near Damascus. Alloush had been away for weeks on visits to rebel frontlines and consultations with rebel factions, opposition groups, and foreign supporters in Turkey and Jordan. All factions in Ghouta operate under the United Command except for Jabhat Alnusra and we call them to join it instead of igniting division. The UN announced on Wednesday that the official number of Syrian refugees has passed 4 million. The UN refugee agency UNHCR said 4,013,292 Syrian have been registered, with 1.7 million in Turkey, almost 1.2 million in Lebanon, about 630,000 in Jordan, and almost 250,000 in Iraq. The estimated number of Syrians displaced inside the country is 7.6 million, meaning that more than half of the country’s pre-war population of 22 million have been forced from their homes. “This is the biggest refugee population from a single conflict in a generation. It is a population that needs the support of the world but is instead living in dire conditions and sinking deeper into poverty,” said UN High Commissioner for Refugees António Guterres. Pro-Assad websites are again claiming success in the Hezbollah-regime offensive to take Zabadani, northwest of Damascus. The sites assert that the offensive, launched last week, has “taken control of half” of the town, held by the opposition since January 2012. The outlets claimed last weekend that the regime force was within 200 meters of the town center. Rebels and activists said the attacks were repulsed, with heavy casualties for both Hezbollah and Assad fighters. See Syria Daily, July 8: Rebels Holding Out in Zabadani in Damascus Province? Rebel outlets say on Thursday that they have blocked an attempt by Hezbollah and Syrian troops to advance from al-Zahraa castle, inflicting casualties. 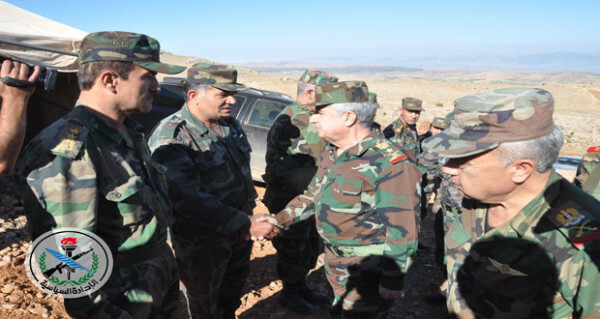 State news agency SANA headlines, “Army’s Chief of Staff Visits Military Units in al-Zabadani”, saying that General Ali Abdullah Ayoub “inspected the combat operations in the city”. However, the photos with the story appear to show that Ayoub is outside Zabadani. State media claims that a new $1 billion line of credit from Iran has been confirmed after more than seven months of negotiations. State news agency SANA said President Assad signed a law ratifying the credit line on Wednesday, following its approval by Parliament. SANA said last month that the deal was agreed on May 19. Syrian officials traveled to Tehran from November seeking up to $6 billion, as a $3.6 billion credit line from July 2013 was running out. President Assad also pressed the case with visiting Iranian envoys. However, Tehran was reluctant amid its own economic problems. The Syrians later reduced the request to $4 billion, but Iran would not move above $1 billion. The line of credit has been essential for the Assad regime to obtain essential supplies of fuel, as well as consumer goods, in Syria’s crippled economy. Syria’s foreign reserves were estimated at $16 billion to $18 billion before the 2011 uprising. They have been depleted, as Damascus lost about $2.5 billion a year from oil exports before the war. PreviousSyria Feature: Tribal Leaders to Work with US Against Islamic State?